2018, Shiseido released new sunscreen, Anessa Perfect UV Skin Care Milk. Note: as of 2019, we due to the postal and aviation regulations, we can not ship this product. This sunscreen is previously called “Shiseido Aneessa Perfect UV Sunscreen Aqua Booster“, what is the very one of the best seller for our 2016 – 2017. We Japanese girls often call this as “Anessa Gold Bottle”, due to previously there were two Gold package and Silver package. Indeed in the formula of 2018, the Silver bottle was discontinued and no followed products. In person, I had good experience with Kanebo Allie, I thought I may buy Allie one by one, but this Anessa is also often ordered. I changed my mind and bought a small bottle. In this formula of 2018, there are no words of “Aqua Booster” on the title name, but they claims there are “Aqua Booster EX”effect. According to Shiseido “Aqua Booster”, this sunscreen effect is stronger when it is wet. Please do not ask me about this. And this UV Skin Care Milk is one of the most strongest waterproof effect. The “Skin Care” seems the moisturising effect, I am sure. Anyway, let me share with how I felt. The emulsion is a little bit yellow shade. On my arm, there are less “shining”. It is not meaning sunscreens with glitters (there are/ were some sunscreens with glitters), but many sunscreens are shining oily, I feel that is so ugly. Compared with Kanebo Allie UV Gel, what I have recently done, this Anessa is less shining oily. Compared with Shiseido Anessa Perfect UV Mild Milk, even Allie UV Gel is less oily. And also, there are no color changing nor white cast. Not bad for using on my body. My facial skin is not tough, I am abrading this is too strong for my face, I will never use this Skin Care Milk on my face. Due to the perfume, I may use this for my arms or legs, I may not use on my neck to decorate. I dislike the scent of Anessa. Let me spray water on my arm wearing this Anessa gold sunscreen. It is true that the waterproof effect is strong. In 2018, I had used some sunscreens, and let me compare. 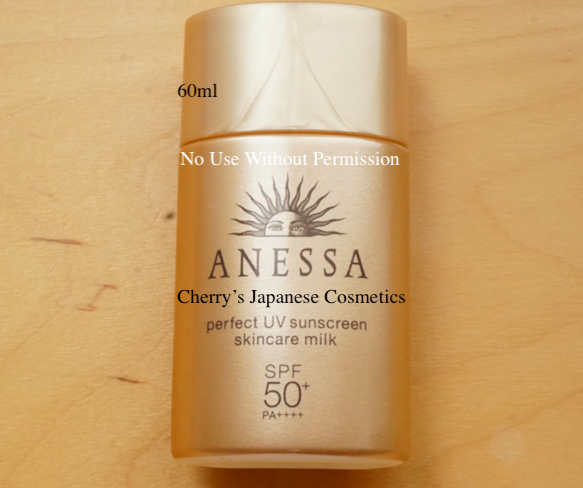 The most mild was Shiseido Anessa Essence Mild Milk, its sunscreen effect is not strong enough (SPF35), but no perfume. Shiseido Anessa Perfect Mild Milk is no sting nor irritation, shining by oil, and no perfume. Kanebo Allie UV Gel is friction proof, a little bit greasy finish, and no perfume. Shiseido Anessa Perfect Skin Care Milk has a little bit strong perfume, but may the most strong waterproof effect among these 4 sunscreens with less oily finish.